Connect Broadband, which has its broadband services spread across Punjab, Haryana and Himachal regions today introduced a 'Connect Rewards' programme to its customers. As the name itself suggests, it's a Reward programme which will avail the users some products listed on the Connect Broadband’s catalogue for free. 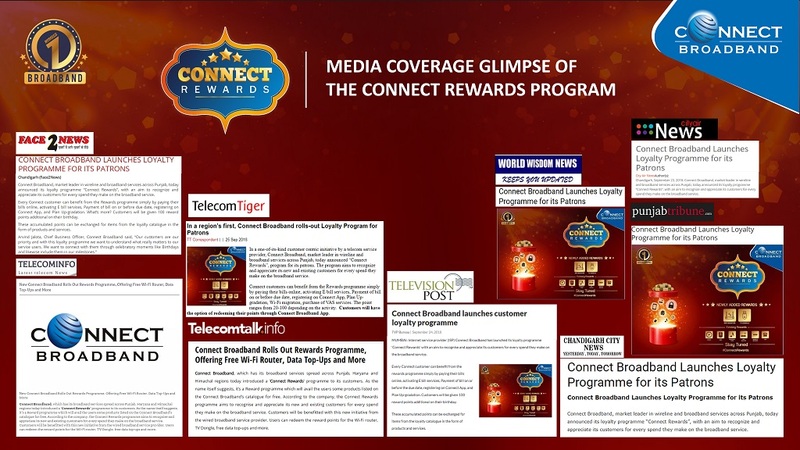 According to the company, the Connect Rewards programme aims to recognise and appreciate its new and existing customers for every spend they make on the broadband service. Customers will be benefitted with this new initiative from the wired broadband service provider. Users can redeem the reward points for the Wi-Fi router, TV Dongle, free data top-ups and more. "Arvind Jalota, Chief Business Officer, Connect Broadband said, "Our customers are our priority and with this loyalty programme we want to understand what really matters to our service users. We want to connect with them through celebratory moments like Birthdays and likewise include them in our milestones."